Women are subordinate to men, should not mix in work or education and must always have a male guardian when they travel, according to new guidelines from Afghanistan's top clerics which critics say are dangerously reminiscent of the Taliban era. The edicts appeared in a statement that also encouraged insurgents to join peace talks, fuelling fears that efforts to negotiate an end to a decade of war, now gathering pace after years of false starts and dead ends, will come at a high cost to women. 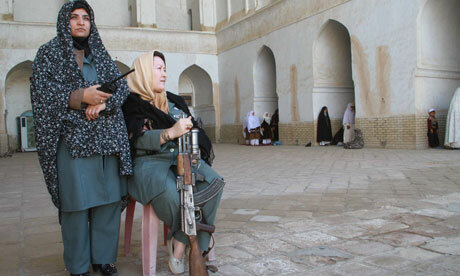 "There is a link with what is happening all over the country with peace talks and the restrictions they want to put on women's rights," said Afghan MP Fawzia Koofi, who warned that the new rules were a "green light for Talibanisation". The points agreed at a regular meeting of the Ulema Council of top clerics are not legally binding. But the statement detailing them was published by the president's office with no further comment, a move that has been taken as a tacit seal of approval. "Ultimately, I don't see a way you can read it as not coming from (Hamid) Karzai," said Heather Barr, Afghanistan researcher at Human Rights Watch. "It's probably not an extreme position for the Ulema Council, but it's an extreme position for Karzai, and not compatible with the constitution, or Afghanistan's obligations under international law." The clerics renounced the equality of men and women enshrined in the Afghan constitution, suggesting they consider the document that forms the basis of the Afghan state to be flawed from a religious perspective.